Hoboken election season is here and with it the crisp air, vote by mail and a little thuggery or what the Old Guard likes to say with a wink and a smile, "A little dab will do ya." A little dab did just fine at the Hoboken BoE forum where thuggish innovation saw the brilliant idea of standing behind the audience and using a flashlight app to shine in the eyes of the Forward Together candidates as they each gave answers to questions. The culprit is well known in Hoboken political circles in numerous unseemly actions intimately connected to Beth Mason and her civic "investments" to him and other nefarious activities against the community. There's been a string of these incidents going back years involving Matt Calicchio of Team Old Guard best known for being on the Mason family payroll; the same family of Mason Civic Association infamy. Think of it as like a mini-Clinton Foundation but not as cost efficient in corruption enterprises and perpetrating wide-scale violence on Americans and their First Amendment rights. There's an app for that! 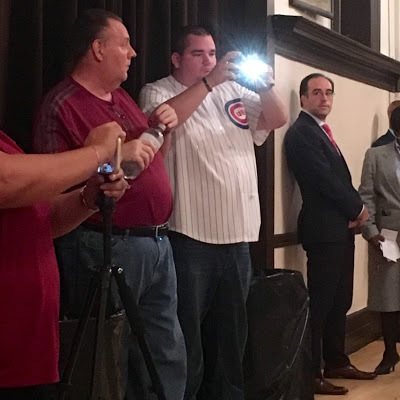 A flashlight app comes in handy to shine into the eyes of candidates when they answer questions or at least OG political operative Matt Calicchio thinks so. Not sure what Eduardo Gonzalez to his left is thinking. He didn't think as a QLC board member to say stop although the moderator tried. There's been some viral transmission in the Mile Square City on the latest antics as word's filtered out. This latest thuggish idea is getting out to both Hoboken voters and parents who are not so enamored as say, a Quality of Life Coalition Board member standing several feet away who is also aligned with the Old Guard and chose to do nothing other than reportedly walk silently away. Et tu Eduardo? No small irony, the list of these activities is a long one preceded by far worse and even the abuse of the court system where the rolly polly WWF-loving OG political operative filed a criminal complaint against this editor for a phone call inquiry on a trial date in a case of a former BoE official who was subjected to his screaming while picking up her five year old daughter at school. The Hoboken mom was picking up her daughter at school when accosted on school property. Alleged thug then followed mom and child to a local pizzeria and sat a table away staring at the mom to send a less than friendly message on that upcoming BoE election. Oh and that phone inquiry saw a phony criminal case last for almost a year and half before being thrown out of court against this editor. One of the submitted perjuries claimed the complainant was being followed. The paymaster boss Beth would follow suit when handed a subpoena to appear as a trial witness in a frivolous litigation involving other political operatives. Is the picture on the cancer in our midst getting any clearer? There's only way message that will get through: accountability at the voter booth. The rest of this story is MSV Premium and will be released late Monday.